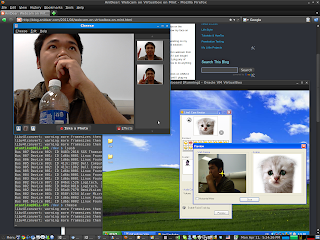 I have been struggling on making my webcam(s) works on Virtualbox 4.0 for the whole weekends. The situation is this, I have to use Cisco WebEx to teleconference with my friends, but it only works for Windows and Mac. Inevitably I feel, I need to use Virtualbox with Windows XP as a guest OS in order to use WebEx. This solution has been working OK for a long time. Since I am not in need of showing my face on the program, I can just use headphone and microphone. Unfortunately, I got a requirement to show my face on WebEx, and I has been frustrating since then. Some webcams use USB2.0 (and strictly 2.0) At least 3 webcams of mine do. I have a built-in webcam from my Dell m1330 (Creative Labtop Integrated webcam), VGear(RX-7), and Logitech C310 which I just bought this morning. Each of them has different symptom, but the common symptom is whenever I plug any of them in, it shuts my Windows XP Virtualbox I currently running off! I don't even have a chance to do anything with it. Here's come the solution. 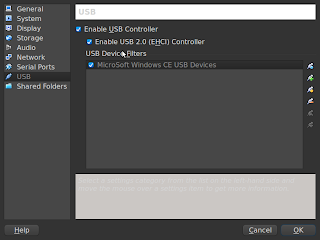 In Virtualbox, by default, it doesn't allow you to use USB2.0. If I click on USB2.0 check box on this picture, I will face a pop up that I can click through, which seems normal until I plug my webcams in and it shuts off. The trick is, "do what you have been warned". I carefully read the pop-up box and it says ... if you want to use USB2 capability you have to install "VirtualBox Extension Pack". So I go ahead and download the pack , although feeling a bit weird it doesn't come by default. After downloaded it, double click it for installation, restart the VM , or maybe your host computer, and you're set. Lesson learned #2, "Always consult Google before buying any gadget", I found the same model but 40% cheaper on Amazon.com. Lesson learned #3, ... Ubuntu , Mint , VirtualBox are AWESOME!! !